SAVING MR. BANKS is an entertaining biopic on the life of P.L Travers and the making of the film adaptation of her book, Mary Poppins, by Walt Disney. The film shows the early stages of their relationship and the difficulties of bringing Travers’ character to the big screen. Travers, whose real name was Helen Lyndon Goff, was an Australian novelist, actress and journalist. In 1924, she immigrated to England where she began writing her series of children’s novels about the mystical and magical English nanny, Mary Poppins. The book was published in 1934 but it took Walt Disney 20 years to convince Travers to agree to sell the film rights to him. Travers was against having animation in the film (and you may remember the penguin sequence from the film), and she also disapproved of some of the sugary sweet songs. But she was most concerned about the changes made to George Banks’ character. You see, Mr. Banks was based on Travers’ own father, a charismatic though alcoholic bank manager who died of influenza when she was just seven. Travers worshipped him and she felt that if she couldn’t save her father, she could save George Banks. Although the film was a huge success and continues to delight new generations, Travers was enraged at what she considered to be shabby treatment at Disney’s hands. Because of this, she would never again agree to another Poppins/Disney adaptation, though Disney made several attempts to persuade her to change her mind. 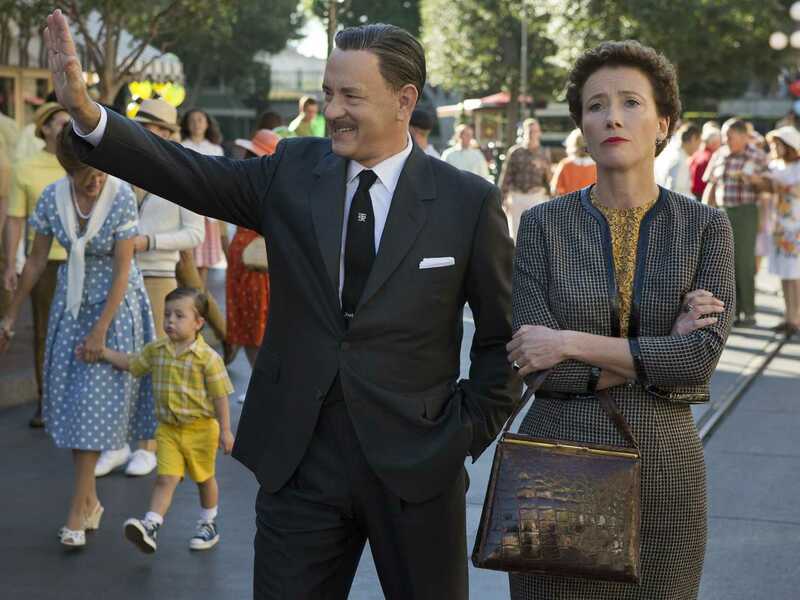 SAVING MR. BANKS stars Emma Thompson as the prim but abrasive P.L. Travers, Tom Hanks as the fatherly but highly driven Walt Disney, and Colin Farrell as the alcoholic yet loving Travers Robert Goff. Surprisingly, none of them was nominated for an Oscar, though they are all deserving – especially Ferrell, who really is magical to watch. The genesis of some of the film’s songs is played out in the film and, while “Supercalifragilisticexpialidocious” isn’t sung, it does make a very brief but amusing appearance. Some critics have said that the film is a shameless heap of corporate PR – a feel-good, self-serving Disney film about the making of a Disney film. I disagree. Let’s be honest about this. If any other studio had tried to make the film, Disney would have slapped them with an injunction and the film would be dead. So who else could make the film other than Disney? And, given that Disney is making the film, why wouldn’t they paint Walt in anything other than a saintly light? Is it somewhat revisionist? Yes, it is but so what? I know that many people in HK have the unfortunate habit of leaving the cinema as soon as the credits start rolling. I would encourage you to stay right to the end to honour those people behind the scenes who are providing you with a couple hours of entertainment. That’s just plain good manners. And, in this film, if you do stay to the end, you will be rewarded quite royally. I’m not going to tell you what you will hear and see, but it’s well worth the two minutes of your time.